Errands and Transportation | Full Circle Home Care Inc.
Those new dings and dents on your aging parent’s car may leave you wondering if your parent should be driving any more. The damage may be a sign that driving safely is becoming an issue due to vision problems, delayed reaction time or confusion. Other warning signs include traffic violations, parking tickets, accidents, getting lost, losing keys or running out of gas. Feeling suspicious, you may have gauged your aging parent’s competency behind the wheel by spending time in the passenger seat while your parent drove. Before your parent’s driving gets seriously erratic, it’s important to have a serious talk about hanging up the keys. Before you broach the subject, it’s best to have good alternatives in mind, such as the senior care errand assistance offered by Full Circle Home Care. 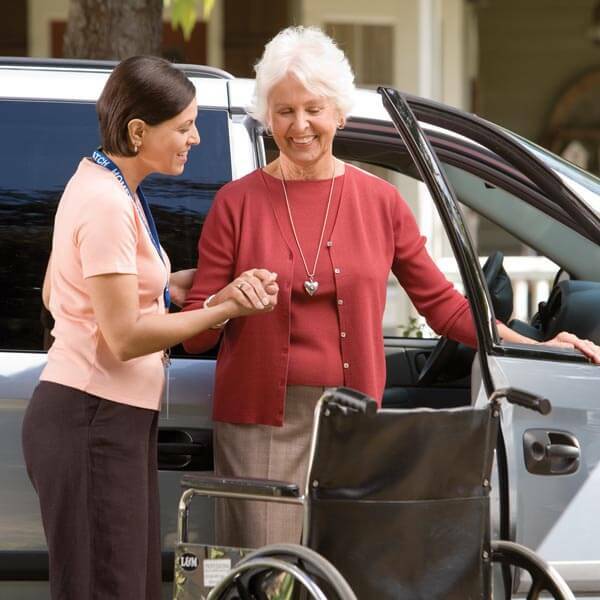 Your aging parents will likely feel reluctant to give up the independence that driving offers, but the good news is Full Circle Home Care’s elderly transportation assistance means they can still run errands, go to doctor’s appointments and visit with friends and family—all without getting behind the wheel. If your parent would prefer reading a book or gardening versus running errands, that’s possible, too, through Full Circle Home Care’s senior care errand assistance. Everyday activities you take for granted—such as bathing, eating or dressing—may be too difficult for your aging parent or disabled family member. To help your loved one live an independent life, Full Circle Home Care provide in home personal care. Beyond basic companionship and housekeeping, our home health caregivers provide sensitive, confidential personal care services in a way that respects your loved one’s dignity and well-being. We can work with you to develop a customized home care plan that meets your loved one’s needs with one or more of the following personal care services. For your aging parent, driving to an appointment can leave them feeling confused, frightened or unable to negotiate the high volume of traffic entering and exiting parking lots. Aging parents who are no longer confident in their driving skills may not know how to arrange for transportation and may miss important doctor’s appointments versus placing a burden on their children by asking for a ride. It’s reassuring to know Full Circle Home Care provides senior home care transportation assistance. Our caregivers can help with transportation and accompany your senior parent to their appointments. Missing doctor’s appointments and difficulties with following doctor’s orders can take a serious toll on an aging parent’s health. These problems may be signs that an aging parent is suffering from memory loss or needs senior home care transportation services. We can help. A Full Circle Home Care in-home caregiver can help your aging parent schedule and keep medical appointments as well as follow doctor’s orders. Picking up prescriptions; going grocery shopping; standing in line at the post office; returning an overdue library book; or simply taking the car in for an oil change. Errands can turn into a never-ending list of chores that can overwhelm an aging parent, especially one with transportation problems. Our caregivers can provide senior homecare errand help–while your parent enjoys time in the garden or reading a good book.